Last weekend was very exciting—box turtle-wise, that is. Saturday night (7/29), friends who were exploring my front garden came indoors to report that a female box turtle was digging a nest along the front of the garden. We all piled out to get a glimpse, keeping a respectful distance, of course. Above: First attempt, Saturday night through a carpet of thyme. She was still working on the hole when my husband and I went to bed that night. In the morning, I was disappointed to find the empty hole, which wasn’t filled in as I expected. I did a bit of research, and found that turtles commonly dig one or more test holes and then abandon them for unknown reasons. Experts speculate that they find the soil conditions unacceptable. Happily, she returned Sunday evening at about 6:00 p.m. and began to dig a second hole in a new location. Above: The start of her second, successful, nest. You can see the hole just beneath her left rear leg. I went out to check on her (and take pictures) two or three times, but I could also watch progress on the second hole from a hall window. I spotted eggs in the hole this time, and she was finished and filling up the hole by 9:30 p.m. Above: Here is a better look at the hole where the eggs were laid. 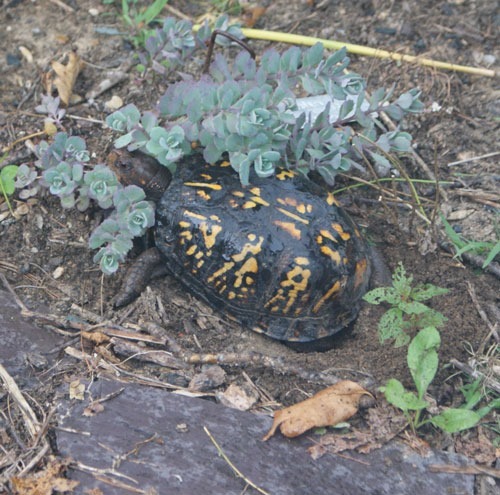 A box turtle nesting in my garden makes me especially happy, because it says something about how far the space has come since we moved here. Although our oak tree has been in the front yard for many years, otherwise the front yard didn’t offer wildlife much else in the way of cover, food, water, or nesting sites. The ground was covered by lawn, and a few non-native shrubs, and invasive non-native ground covers were clustered up against the house. 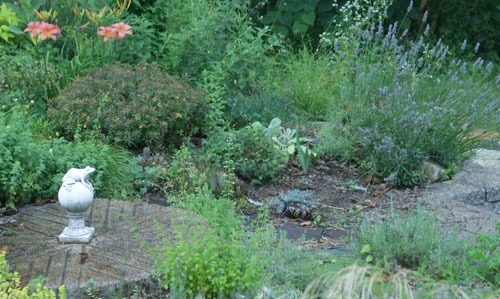 Above: Today, the garden is overflowing with plants, both native and non-native. The garden is now far more wildlife friendly. Ample mulch and dense plantings create lots of places to hide and stay cool, and loose, well-cared-for soil provides opportunities for digging. Box turtles are omnivores, so they eat plants and fruit, as well as insects and other creatures. They love slugs and snails, which is more than enough reason to take steps to make them feel welcome and happy in a garden. In addition to songbirds and turtles, I also have frogs in the tiny pond I dug several years ago, plus skinks, snakes, and other wildlife. I am also changing the plan for the lower edge of the garden. I originally intended to add simple steps to make climbing the slope on that side easier, but with the appearance of box turtles, I have scrapped that plan. I will settle for a simple ramp instead so they can come and go easily. The transformation of my front yard underscores the fact that it is possible to take a barren yard and recreate habitat for wildlife. Loss of suitable habitat, plus fragmentation of existing habitat are two causes of decline in box turtle populations. Of course, collisions with cars are another, so keep stopping for turtles on the road. When you see them, move them directly across the road, keeping them pointed in the direction they were going. 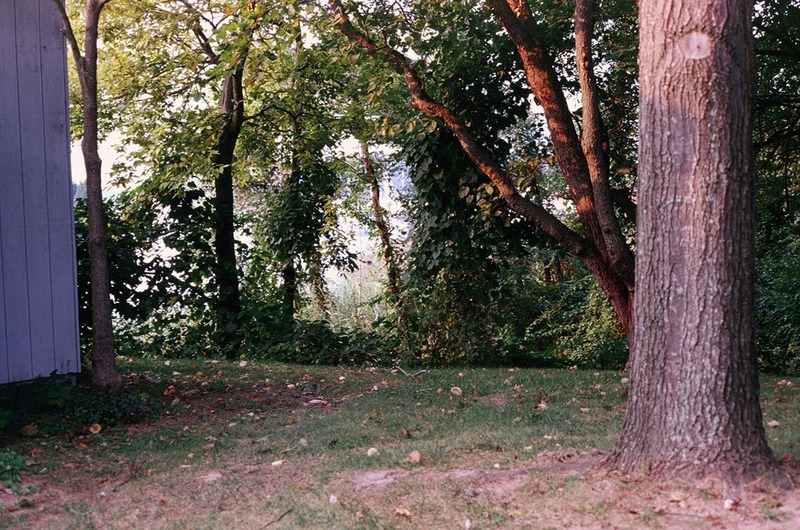 Above: I don’t have a photo of the exact nest site (it was occupied by a dumpster during our renovation), but this before shot of the front yard provides a clear indication of where the garden started and the reason it did not attract much wildlife. My research indicates that the eggs should hatch in about three months. While I will keep an eye out for hatchlings, I don’t expect to see them. The hatchlings are extremely secretive, and they are also very vulnerable to a variety of predators. My plan is to deepen the leaf litter mulch in the garden this summer to give them plenty of help hiding. I will also be watching where I walk much more carefully come September! Since most turtles live their lives no more than 250 yards from the nests where they were born, I am hoping that this nest signals an upswing in the turtle population around our house. 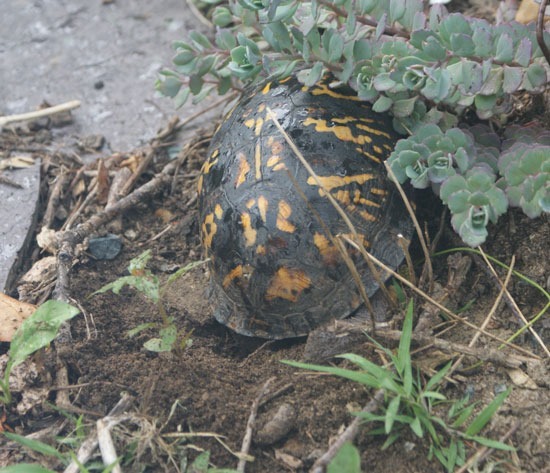 If you are interested in reading more about box turtles, these links are a good place to start. haven’t seen a box turtle in years. Glad to know they still exists! I did see 3 Pilated Woodpeckers yesterday. Have a happy 4th! Tried to save one last week. Saw a turtle crossing the road, made a uturn to help it. As I got out of my car, a truck came, went out of it’s way to cross the yellow line and crush it, about 15 feet from me. Sob. I’ve had that happen, too. It is so sad and so frustrating! I keep stopping every time I see one, though, and I’ve saved lots over the years, both sliders and box turtles. Keep up the good work! 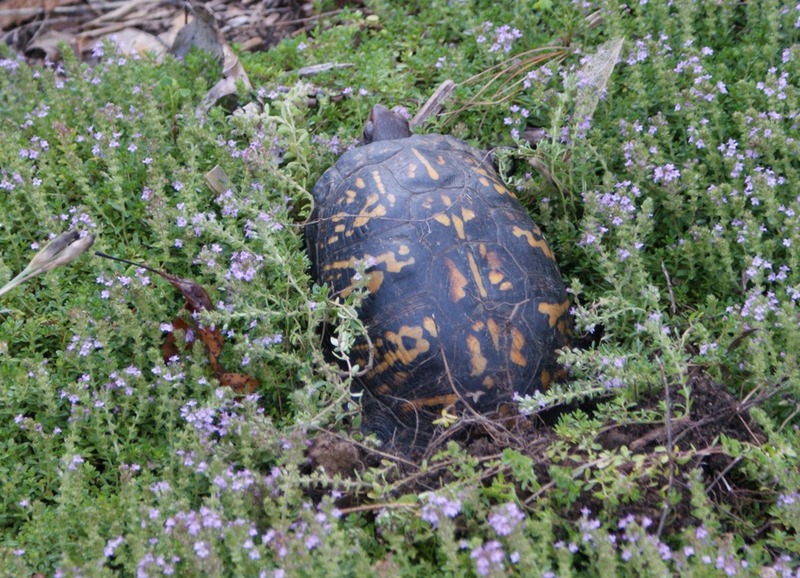 sweet…nice to have the box turtles laying eggs in your garden!! I have yet to find any eggs but I know they are there since we have alot of the Eastern Box turtle in our area. Seen alot of them this year, check it out. Great pictures, thanks for sharing them! I think you have unusually beautiful ones. They are really brightly colored! “My” turtle covered her nest up completely. Unless you saw one laying, I don’t think you would be able to spot a nests. I have seen very young turtles–maybe 3 inches across, but I have read that they are very secretive.